The cave of Petralona "embellished" with stalagmites and stalactites is located in the west foot of the Katsika (Goat) mountain and in an altitude of about 300 meters from the level of sea. It was found in 1959 by the inhabitant of Petralona, Mr. Philippos Hatzaridis and it became well known all over the world in 1960, when another inhabitant of Petralona, Mr. Christos Sarrigiannidis, found the skull of Arhanthropos. The systematic excavations of the Cave began in 1965 by the founder of the Anthropologic Company of Greece, anthropologist professor Aris Paulianos. His researches proved that the Arhanthropos is about 700.000 years old, and this makes him the "oldest" European. This age was determined after the detailed analysis of stratigraphy (until today 28 geological layer have been revealed), and after studying the primitive and Paleolithic tools as well as the palaiofauna that were discovered in almost all the layers of bats. In order to verify the age, the contribution of nucleonic is very important. The materials that have been dated are bones, argil, stalagmites and ashes. These are fire traces - the oldest ones that humans have ever lighted. The capital of Chalkidiki, Poligiros, is located at the center of the Chalkidiki peninsula at the foot of the Holomontas mountain. 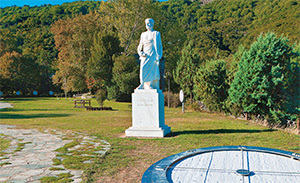 At the northern part there is a green hillside that reaches the top of “Tsoukalas” (890m height) from where one can gaze at the panoramic enchanting view: that is, the three peninsulas (Kassandra, Sithonia and Mount Athos), the picturesque islands of Diaporos, Ammouliani and Kelifos. Nea Moudania is a fishing destination and a modern town with a well-developed beach and sea. It possesses a commercial harbor that can serve tourist and fishing boats, it has Public Services, Banks, the greatest commercial and tourism businesses as well as a large number of commercial stores and shops. Stagira where the great philosopher was born.